I've been meaning to get a copy of this -- so thanks so much for the review and the giveaway. I'm married to a Wisconsiner who believes it isn't dinner until the cheese gets added. Thanks for the giveaway! What a great giveaway and review. I have to enter for. This book. It just isn't dinner without a cheese course! I have a review copy of this one and look forward to reading it... enjoyed your review, too. Sounds interesting, but not enough for me to want to read a whole book about it! ;) Great review! I have a copy of this and I'm looking forward to reading it since we were in France last month. Interesting book. I want to have it just for the pictures alone! I do love a strong French cheese and would probably enjoy the ancedotes. I just read and reviewed this book and have to agree that some parts were a little faltering. But still an overall interesting read. 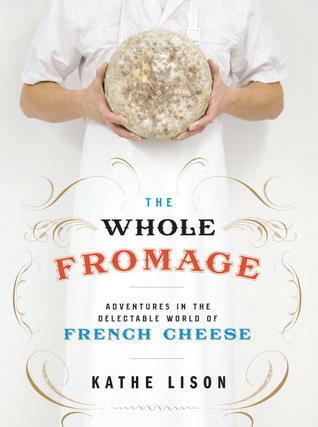 I have a friend who is a real cheese buff, she would love this book. Great honest review. Doesn't sound for me but I loved reading your review. Heather: There aren't actually any pictures of cheese, but they're all described beautifully (and I'm sure a wikipedia search would bring up lots of photos!). And there IS a lovely little map of the cheese regions/where they're from. Hello~Just wanted to chime in and say thanks for reviewing the book. Sorry if some parts we're to your taste, though I'm happy you found some things to enjoy.